Five years, two generations and one half-century of races lead Formula E to an important milestone this weekend. 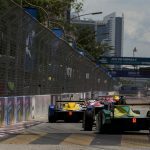 Hong Kong’s E-Prix marks the series’ 50th race weekend, and it’s yet another in an abiding stream of examples why it’s here to stay. If the first fifty races are Formula E’s Genesis, then there’s an entire testament of future history still to store in the archives. This wondrous love affair with the electric began on a sunny September afternoon, back in 2014, and from here on racing would never be the same again. Beijing enjoyed the honour of hosting Formula E’s maiden race, and it proved to be an event for the ages. Nico Prost led the first Formula E pack away, lighting up his rears on his way to preserving his pole position from Lucas Di Grassi. Bruno Senna’s first voltage voyage lasted not even a lap, while the race developed into a Nick Heidfeld-centric chase through the field. By the last lap, he had dispensed of all but one of the grid’s drivers – Prost, who had led from lights out, was still gamely clinging on. Coming into the final corner of Beijing’s L-shaped street track, however, they brought about the first major test of the Gen1 machine’s safety credentials. Prost barged a mid-overtake Heidfeld under braking, and sent him careering into the outside wall while scuppering his own race. Di Grassi was the one to take the flag and become Formula E’s first winner. Hong Kong’s second E-Prix had a distinct feel of a Monaco 1982 to it – it was the race seemingly no-one wanted to win. 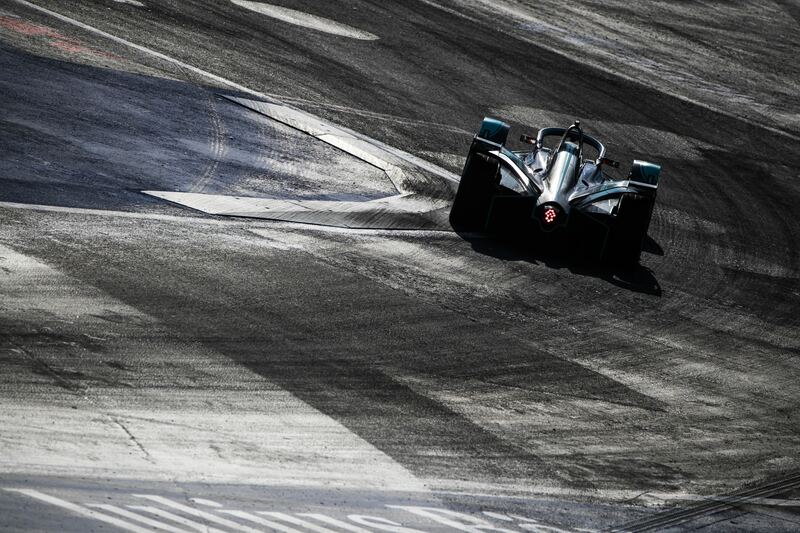 The race started under the lead of Felix Rosenqvist, heading the first ever Formula E safety car start, and his aforementioned advantage lasted for just a single corner. The Swede dropped his Mahindra going into the first turn, and proceeded to undo all the good work he had made for himself in qualifying, even serving to ruin Luca Filippi’s progress by nudging the Italian into the wall. Behind, Venturi rookie Edoardo Mortara usurped the lead we all expected Felix to hold, and for a long duration of the race looked to have only his second race strung up nicely. Antonio Felix da Costa suffered a 54 second mid-race car switch, dropping him from fourth into the lower reaches of the grid, while just three laps from the end Mortara lost control of his Venturi and spun it out of contention. Daniel Abt inherited what was seemingly his maiden Formula E win, only for an after-race penalty to yank the winners’ medal back from his grasp. And after it all, Rosenqvist did get his win – in the messiest fashion of all. 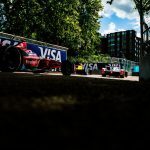 2018’s iteration of the New York E-Prix was all about the title fight – not the drivers’ championship, which had gone in the favour of Formula E’s fourth champion in four years Jean-Eric Vergne a day before, but the David vs Goliath battle for the constructors between the works Audi Sport ABT Schaeffler team, and customer outfit Techeetah. Vergne strained with every sinew of his body to launch past the Renault e-dams of Sebastien Buemi at the start, while teammate Andre Lotterer kept Techeetah’s title hopes alive with a third place on the road. But the Audi works drivers weren’t about to take this lying down: Lucas Di Grassi was already on the charge, getting past Buemi as he tumbled down the field and keeping the Techeetah duo within range. And then, Lotterer found himself slapped with a drive-through penalty for jumping the start. It was a devastating hammerblow to Techeetah’s hopes, even with their champion leading the race. They had to hope the Audi cars didn’t finish within close proximity, but both Di Grassi and Abt played the margins perfectly. They went past the flag second and third, and Techeetah were denied the last piece of the fairytale puzzle. The close nature of Formula E, mixed with the unforgiving street circuits they commence battle on, should naturally lend themselves to accidents – lots of them. And no race had as much into-the-wall carnage, at a single turn not less, as Buenos Aires back in Season One. The race began with Sebastien Buemi leading the way, and Nick Heidfeld pulling off an audacious drifting move around the outside of Jaime Alguersuari into second place. Not long after, the chaos began to ensue at the chicane area. Karun Chandhok’s suspension broke when he ran over the yellow sausage kerbs, and wasn’t the only one to find himself in the outside wall. Lucas Di Grassi was the next victim of the wall, plunging rear first into the concrete claimer of race cars. His race lead was extinguished, and Heidfeld went on to take the lead of the race, only for a drive-through penalty for speeding in the pitlane to deny him his first Formula E victory. Antonio Felix da Costa instead took the line to give Amlin Aguri their only win in Formula E history, and took the underdog mantle Quick Nick was so desperate to have. One of Formula E’s finest races to date was one that only happened two weeks ago – but even within a few years time, we’re confident it will be one of the iconic races of the Gen2 era. If Buenos Aires was about keeping your machine out of the walls, this was about keeping the battery levels above crisis point. Rookies Pascal Wehrlein and Oliver Rowland were the headline-grabbers at the start – Wehrlein expertly holding onto his lead, while Rowland slammed a brave lunge on the hesitant Lucas Di Grassi to inherit second place, and Nelson Piquet Jr brought out only the second red flag in Formula E history, launching into the air after hitting Jean-Eric Vergne’s rear end before crashing back down to earth, hitting Alexander Sims. Di Grassi managed to take advantage of Rowland’s poorly-timed Attack Mode collection, however, and assumed the role of chief chaser. He pushed Wehrlein to the ragged edge, and on the last lap forced Wehrlein to take the escape road, while behind the two Nissan e-dams cars of Rowland and Buemi ran out of charge. All drivers were struggling with their energy levels, and at the last corner Wehrlein hit zero, forcing him to concede to Di Grassi and da Costa.